This one is 100% me. I have a hard time staying serious and I am almost always cracking up! Hi lovelies! Ok, let me tell you all about this fun little shoot I did. You know how around the holidays, all of these fabulous ads come out and they show elaborate parties, fancy table settings with beautiful people exchanging gorgeously wrapped presents? I don't know how you all celebrate the holidays, but this is what I would call a FANTASY. This is not real life for me at ALL. But wouldn't it be lovely to get all dressed up in an amazing ball gown and pretend you were that girl, just for an hour? I thought so! And have I mentioned before how I am the type of person that thinks if something is worth doing, its even better doing it with someone else? I operate well as part of a team- I played doubles tennis growing up, I work at a large law firm as opposed to practicing solo...inotherwords, I had this idea and couldn't imagine doing it alone! I called my stunning friend Brandee and my other stunning friend @bleudogfotography and this is what we put together. 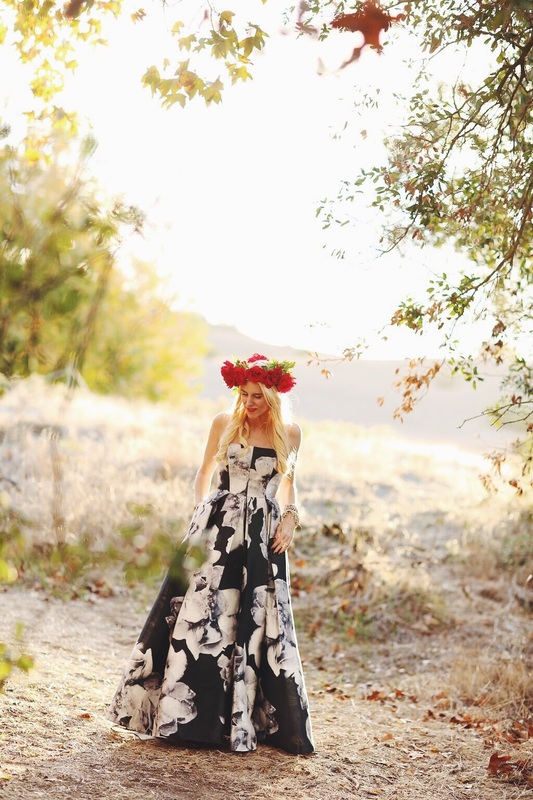 From the flower crowns, to the location, to the dresses (Mine was Monique Lhullier and Brandee's was Marchesa and we got them both from Rent the Runway. Which was easy and fast and perfect). How beautiful did these turn out? I want to do this for every single holiday! Valentine's Day! Easter! Groundhog Day! You are going to be so sick of me. You are going to say "There goes Michelle in another ball gown!! I am telling you, just try it! You will adore it! This got me to thinking about how printed dresses are so pretty. I tried to link some (reasonably priced) holiday dresses below in case you wanted to try something like this for your holiday party! Happy happy day my sweet lovely readers!